While I hate that summer is almost over meaning less daylight hours and winter just around the corner, fall is my hands-down favorite weather season of the year. It also means it’s fall racing season! I haven’t raced throughout the entire month of August and am getting a little stir-crazy, so I’m excited that my fall line-up of races is almost here. I’m a little terrified that I have a half marathon so soon, but then when I think about it I’ve been running further than that during my long runs for a month and a half now including a couple 17 milers. I’m a little concerned about keeping the pace I want so this will be a great test of my fitness. Most of the course is along the Marine Corps Marathon route as well, so it’ll be great practice! I’ll be running both the 5k and the 10k put on by Pacers as part of the Clarendon Day Festival. I’m so excited for this race. I’ve never done two races in one day before and I’m really looking forward to the speedy, mostly downhill courses. The 5k is up first so I’m going to shoot for a PR in that and then just see how the 10k goes after I’ve gotten myself back up the hill for the start of that one! My coach suggested I look for an 8k or 10k this week and I’ve found one of each – both pretty close to home and roughly the same price. The 8k is closer but the 10k is flatter and a familiar course for me. Advice is appreciated! If you’ve done either of these races in the past, let me know what you think about them. This is the big one – the race I’ve been waiting all year for since I had to defer my entry last year while stuck in physical therapy. It’s my chance to finally get my Boston Qualifier in my 10th marathon. I simultaneously can’t wait for it to get here and am terrified of it getting here too soon. I love this race though. It’ll be my third MCM and I LOVE the course change announcements recently unveiled that make it more similar to my first go at MCM in 2006. They’ve done away with the Canal Road portion of the race, which I was never a big fan of, and added in Rock Creek Parkway. Let the countdown commence! After – wrapped in my space blanket, happy to be done! Let me know where you’ll be racing this fall!! Any big PR goals? 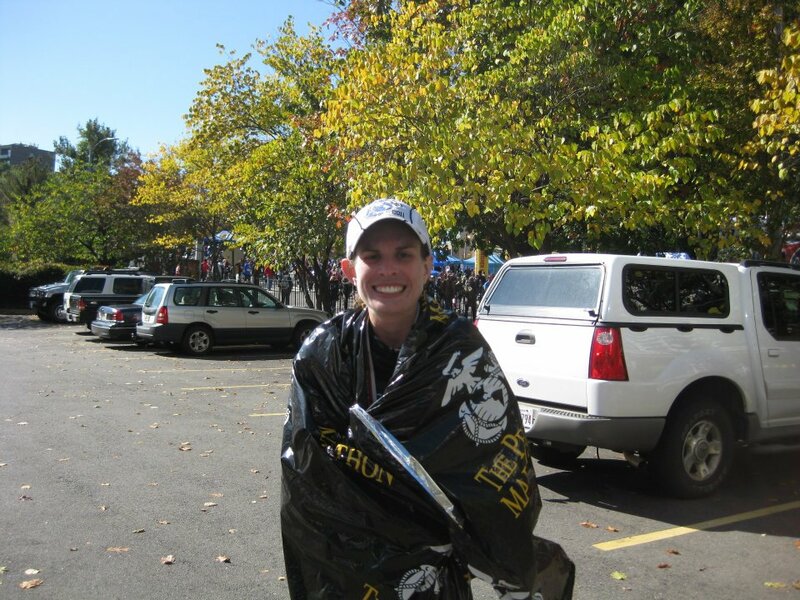 This entry was posted in D.C., Fitness, Marathons, Races, Running and tagged 10k, 5k, Boston, BQ, fall, fall running, marathons, races, training by Colleen Lerro. Bookmark the permalink. That Marine Corp race is such a big one on a lot of lists! I hadn’t even heard of it until this year! My big goal is an under 2 hour half marathon. I have two halves scheduled in the fall, so we’ll see what happens! Until just recently I lived right at the finish line for Marine Corps, so it was hard for me to miss it! That’s a great goal…good luck with your training and races!